No codes on the packaging, but there is a tiny window at the bottom of the back you can use if you know the colours and shapes of the characters you want. Or, if you have the time, for Series 3 onwards there is a trick with the character cards that took about 5 minutes to figure out. Inside each pack is a character card and two folded sheets of paper. When holding the pack so that the front is facing you, the papers are at the front (inside) and the character card is behind them (with the figurine at the back of the pack). So what I did was, pushed everything to the top of the pack, then held the thicker character card at the top with fingernails while sliding the papers down to the bottom with other fingernails, which will reveal the name at the top of the character card through the aqua part of the pack. 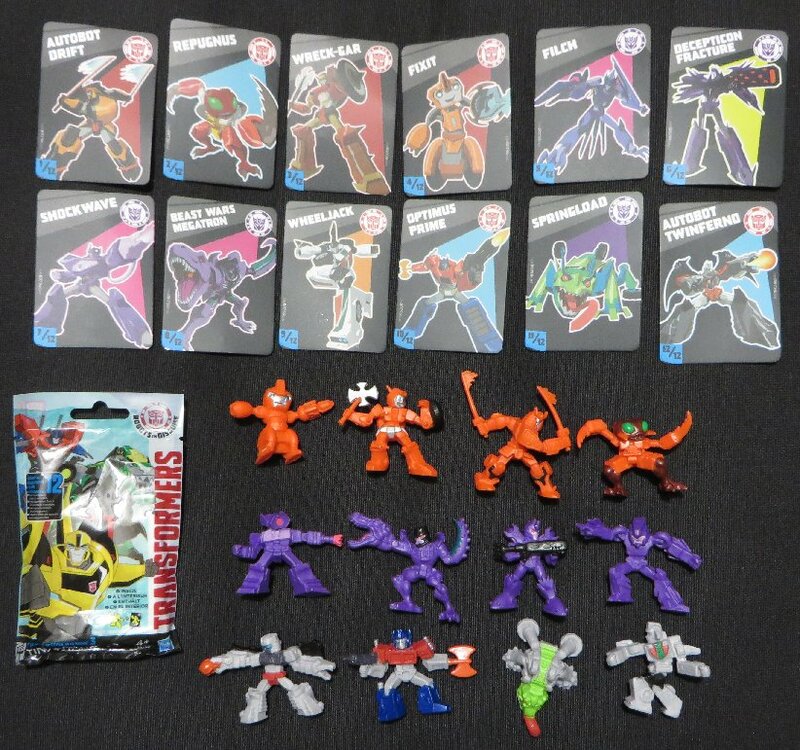 A couple of the names have Autobot at the top, so if you can't read the second word (name), check the window on the back of the pack and see if it has the plastic colour you are looking for. Same with Fixit and Filch in Series 3, as their name are very small, so might be hard to read enough letters through the aqua plastic. Each series has been packed differently. Series 3 - has all the character cards facing forwards, but behind the paperwork (see the instructions at the top of this post). Series 5 - same as Series 3. Series 6 - same as Series 3. Last edited by griffin; 19th June 2016 at 02:00 PM. Thanks for that Griffin! Worked a treat! I had grabbed one randomly a week ago and been shocked to find a G1 character inside (even if they do call him 'Twinferno') But the quality seems that crappy I didn't want to end up with any non-G1 figures. I took a chance last night and ended up with Filch. That's when I posted.